Heat oven to 375°F. 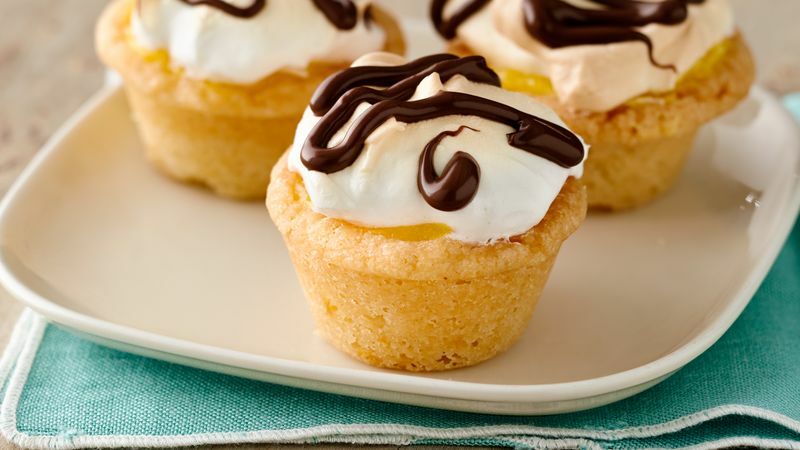 Spray 24 mini muffin cups and top of pans with Crisco® Original No-Stick Cooking Spray. Place 1 cookie dough round in each muffin cup. Bake 15 to 20 minutes or until golden brown. Cool completely in pans, about 20 minutes. Loosen with tip of knife; gently lift out, place back into muffin cups. While cookie cups are cooling, in 1 1/2-quart sauce pan, mix butter, 1/2 cup of the sugar, the coconut milk and egg yolks with wire whisk until well blended. Cook on medium-low heat until mixture thickens, stirring constantly. DO NOT BOIL. Stir in coconut; set aside. In medium bowl, beat 3 of the egg whites with electric mixer on high speed until foamy. Gradually add remaining 1/2 cup sugar, 1 tablespoon at a time; beat until stiff peaks form. Spoon warm coconut mixture into cups. Spoon or pipe rounded tablespoon meringue over each cup. Bake 10 to 12 minutes or until meringue is light golden brown. Cool in pans 20 minutes. Meanwhile, in small microwavable bowl, microwave chocolate hazelnut spread on High 15 to 20 seconds or until of drizzling consistency. Drizzle over meringue. Serve warm or cool. Store in refrigerator.